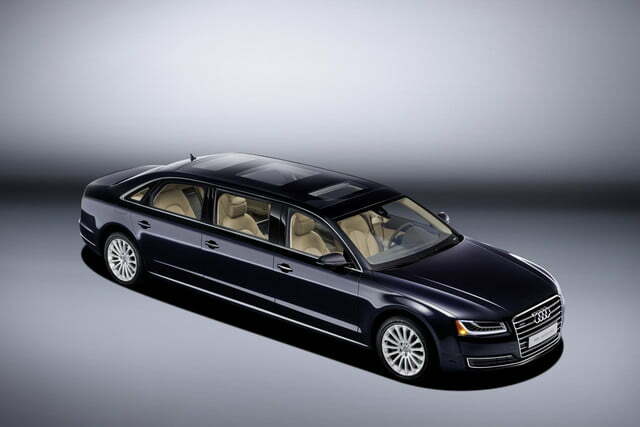 Audi has unveiled a one-of-a-kind A8 L that stretches over 20 feet from bumper to bumper. 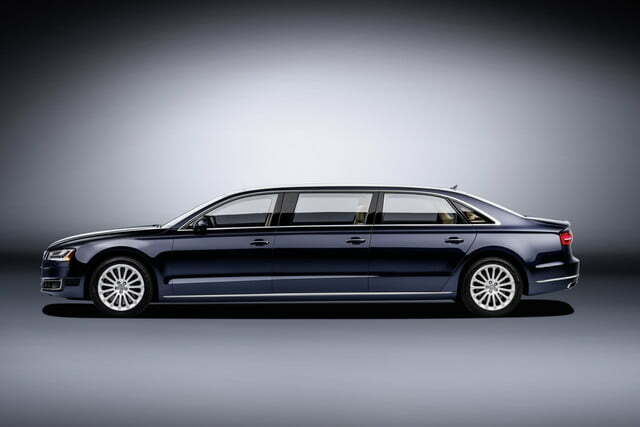 The limousine was commissioned by a wealthy buyer in Europe who found the long-wheelbase A8 L simply not spacious enough. The extended model is all but identical to its series-produced sibling from the tip of the front bumper to the A-pillar. 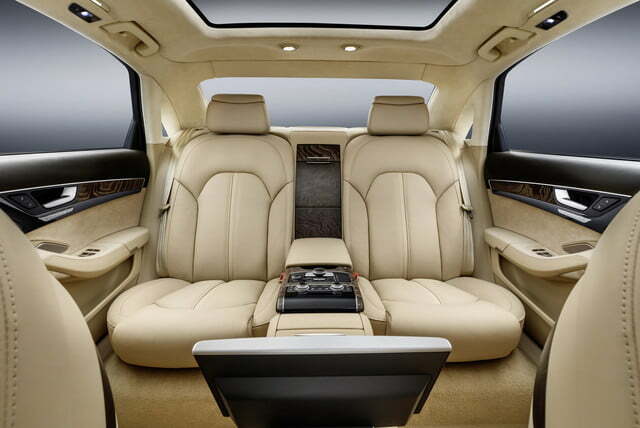 Beyond that, Audi has added 3.6 feet of sheet metal to the wheelbase in order to create a more spacious cabin. 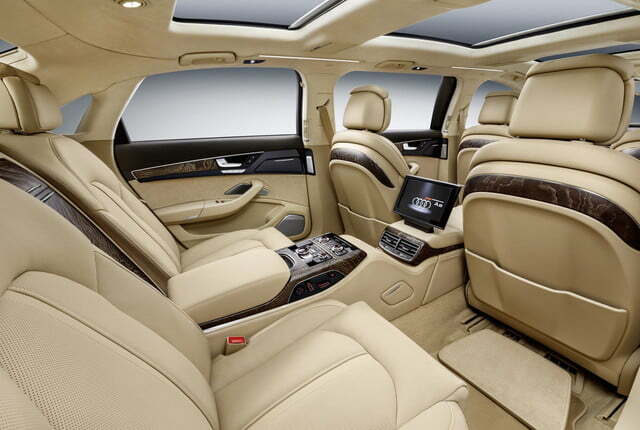 The company has made subtle modifications to the body to give the limousine a more stylish silhouette, and it has installed a 7.9-foot-long roof panel to ensure the cabin is well lit. 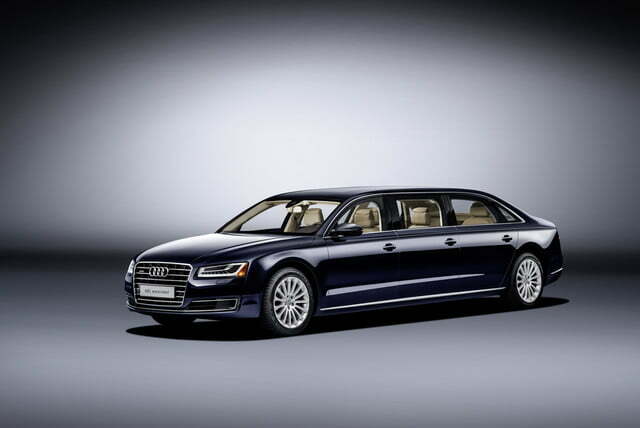 Turning the A8 L into a limousine wasn’t as simple as welding a few sheets of aluminum between the axles; Audi explains the process took a year from start to finish. Notably, engineers had to strengthen the roof with aluminum profiled tubes and cross-braces. 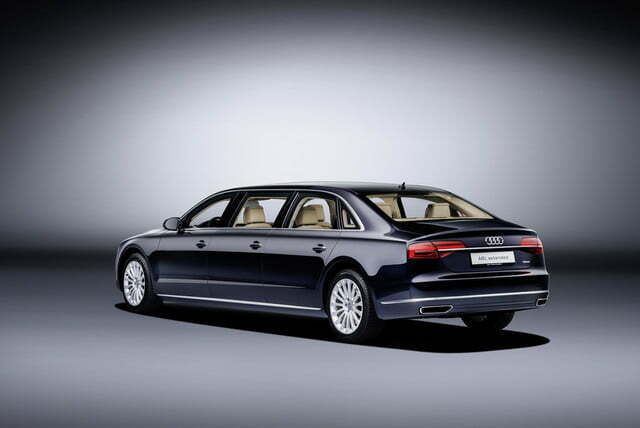 The extended model is consequently nearly as rigid as the regular A8 L.
Fitted with six doors, the A8 L extended offers space for six passengers spread out over three forward-facing rows of seats. 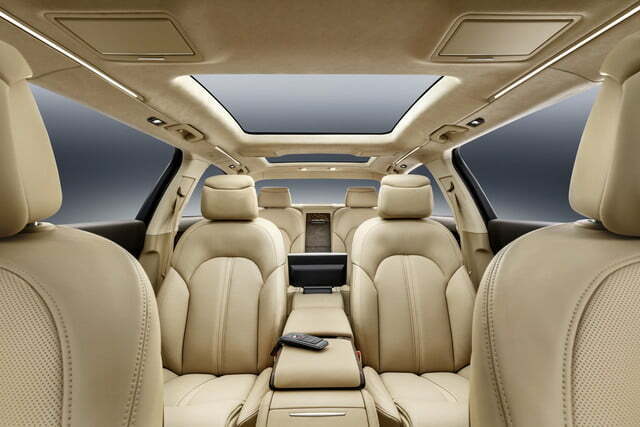 The passengers benefit from individual sun blinds and extra-supple beige leather, while the two riding in the third row get a cooler and their own entertainment system. 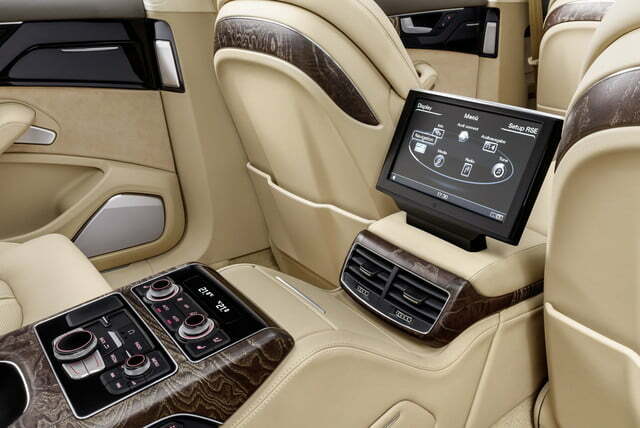 Real wood trim on the six door panels and on the long center console adds a luxurious touch to the cabin. The modifications don’t extend into the engine bay. 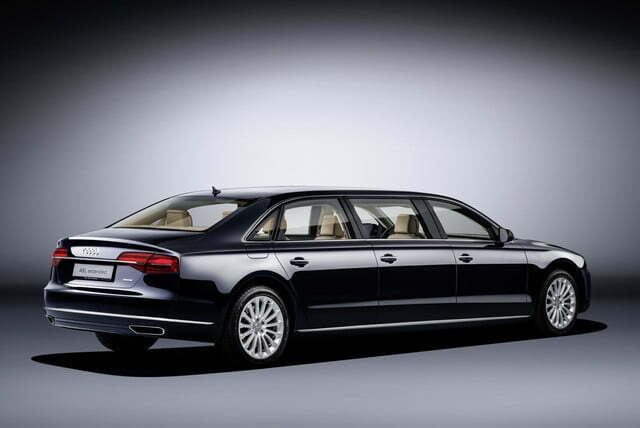 While the A8 L is offered with a mighty W12 engine, the customer who commissioned the limousine asked Audi to install a 3.0-liter TFSI V6 mill that makes 310 horsepower from 5,200 to 6,500 rpm and 324 pound-feet of torque from 2,900 to 4,750 rpm. The six-cylinder spins all four wheels via an eight-speed automatic transmission and Audi’s quattro all-wheel drive system. 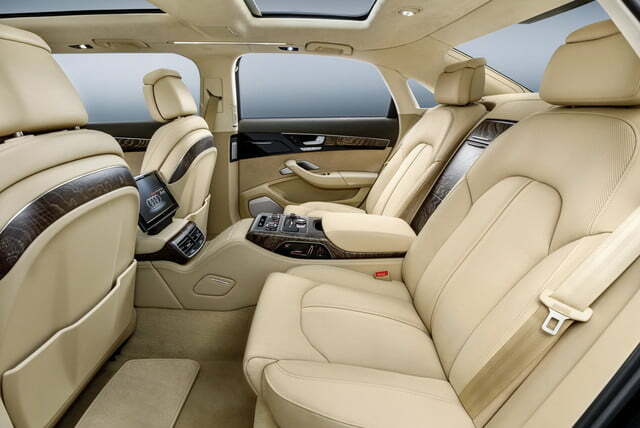 The V6 sends the 5,330-pound, one-off model from 0 to 62 mph in 7.1 seconds, a figure that makes it over a full second slower than the A8 L. Top speed remains electronically limited to 155 mph. Audi has installed bigger brakes borrowed from the performance-focused S8 to offset the weight added by the extra sheet metal. 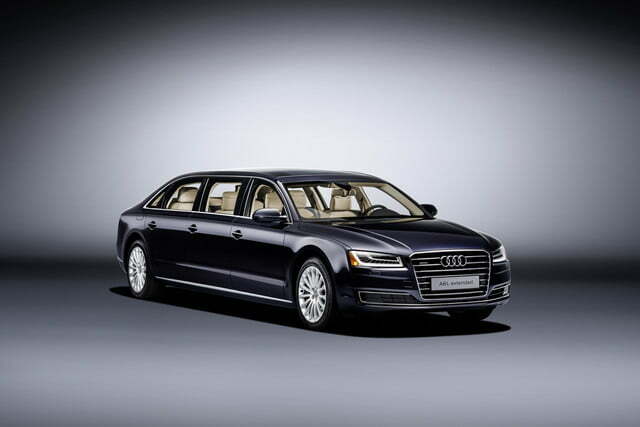 At the time of writing, the Audi A8 L extended is a one-off that’s unique in the world, and it won’t be added to the company’s catalog as a regular-production model. Audi hasn’t revealed how much the conversion cost, or where the special model is headed to.